THE man next to me is upside down, balancing on his head. His feet are shot straight in the air, hands tucked under his head and eyes closed in deep thought. I stifle a wail as I try to copy him, mentally preparing my head to accept my entire body weight. I’m supposed to be doing the Sirsasana, a yoga pose intended to boost concentration and reduce tiredness. Instead I sit and slump, twiddling my thumbs as I wait for the rest of my outdoor yoga class to finish, entirely defeated in my first attempt at Ashtanga. Unfortunately for me, I’ve chosen the wrong day to start my yoga health kick at the beautiful, open-air podium at the Desa Seni Yoga Resort in Bali. Ashtanga is the one of the most “powerful forms of yoga”, my Spanish yoga teacher tells me, and I assume, not for feeble beginners like me. I return the next day. Thankfully it’s an easier session with meditation, which just involves sitting around in a circle trying not to open your eyes and peek at the others. My instructor’s hand moves above her head as she begins swatting repeatedly at something above it. Apparently it’s her niggling thoughts. “Feel the thoughts in your soul. Let them float away,” she enthuses. While I consider this a feat probably harder than Ashtanga, I’m kind of enjoying these sessions. If it’s not already clear, I’m no yoga enthusiast. But after a few lessons, I’m calm, relaxed, content and completely “zen-ed” out. 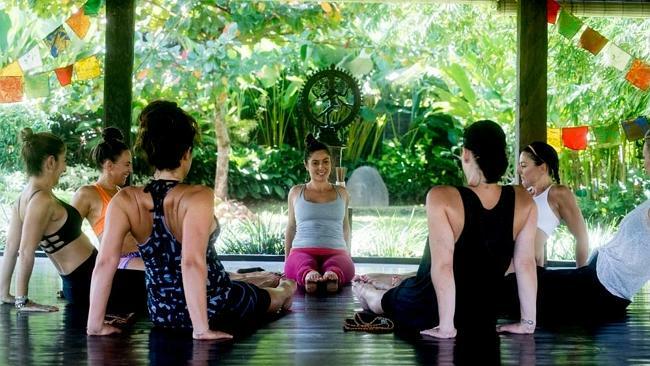 Yoga is just one of the many services offered by the Bliss Sanctuary for Women in Canguu, the Bali retreat I’m staying at. I have unlimited sessions as part of an all-in package for the solo female traveller. When the yoga is done, daily massages offered by an in-house team of beauticians are on the agenda. I have my pick from any I feel like on any day – traditional Balinese massage, body scrub, a mani-pedi, head and shoulder treatment – the list goes on. The experience gets more interesting with Bliss’s spiritual healers, psychics and tarot card readers. When I meet the latter, a 20-something Balinese named Erlanga, my scepticism turns to surprise when he offers specific dates about future events that will affect me. I’m apparently going to meet a friend who will become more than that later this year. Local healer Sami, who could pass for a 30-year-old but is actually in his 50s, advises me I’m hot. No, not that kind of hot. I have too much alkaline in my system, he says, which explains why I’m always so thirsty. I should drink more water because my energy levels are aligned to the Taoism’s “Yang” concept associated with dryness and heat. I ask Sami how he knows what he does. He gives me an answer I take as the Balinese equivalent of that old saying, “I’m kind of a big deal”. Sami is a fifth generation healer who’s been flown to all parts of the world for his expertise in diagnostic and intuitive massage. He’s part medical clairvoyant, part reflexologist, chiropractor and osteopath all in one. The popularity of Bali’s healers has boomed since the Eat-Pray-Love phenomenon. So now I’ve effectively ticked that off my bucket list. Bliss is well-located in Canguu, close to the hub of beautiful Seminyak and far from the tourist trap of Kuta. There’s no pressure to venture outside but whatever you choose to do – whether it’s horse riding, tours, shopping – they’re all accommodated and well-planned out by the hostess. I spend hours of my time at the resort lying by the pool, sipping on a juice concoction that’s been prepared just for me. Meals are all inclusive in the package, so I don’t have to worry about what and where to eat, with staff preparing dish I select from a set menu. The place is aimed at empowering women through personal growth, a healthy outlook and relaxation. I’m not sure about empowered but I leave feeling renewed, inspired and a little bit spiritual. Getting there: Virgin Australia flies from Brisbane, Melbourne, Perth and Sydney to Bali. 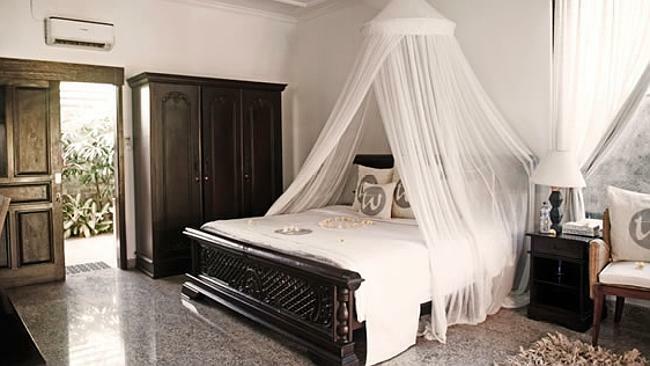 Staying there: Bliss Sanctuary For Women is a women’s-only resort 45 minutes from Denpasar. It’s suited for the busy girl looking for a bit of time-out with a package of experiences focused on yoga to even one inspired by the novel Eat-Pray-Love. Prices start at $2500 (including accommodation and all meals) for the five to seven day Bliss package. For more, visit blisssanctuaryforwomen.com. The writer traveled as a guest of Bliss Sanctuary For Women.